I just finished ghost-writing a 5-part blog for Tubifi and then I was heading out on vacation. So instead of delaying the blog post until my return, and instead of posting it without any social media support, I decided to use HubSpot’s Social Media Publishing tool to automate some posts to promote the content and drive traffic. Here’s how I did it. Easier to do all the WordPress work at once. Custom navigation and CTA at the bottom of each blog post in the 5-part series. I was able to build navigation within each blog post to allow visitors to navigate easily from wish list item to wish list item (see image). Posting each wish one-by-one would have made it difficult for visitors to consume all the content because they would have had to remember to come back tomorrow for the next wish to be published. Even though it was all posted at once, you will see I employed a strategy that spread out social media promotion over the course of a week or so. I was careful to also include a CTA banner at the bottom of each post to try to convert readers to leads. HubSpot has good CTA (“Call To Action”) functionality where you can test 2 or more offers against one another to see which one pulls better. Set it up in HubSpot, then paste the code onto any page, and then track the results. 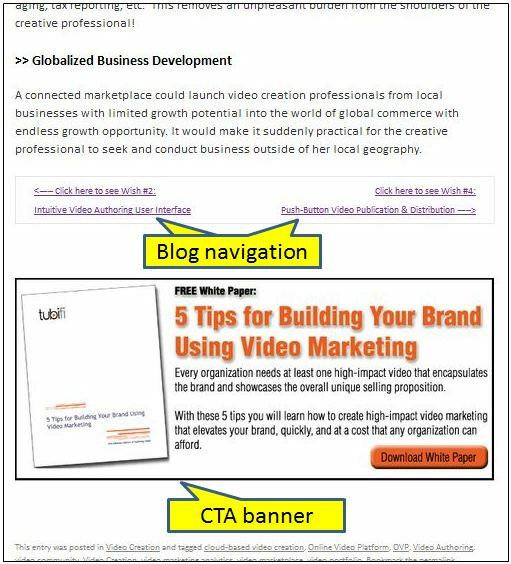 So you will see in the image that the CTA code generated by HubSpot is testing a banner for a free white paper vs. a banner for a free recorded webcast (FYI the white paper is pulling better on the blog but the webcast is pulling better on the home page). HubSpot’s Social Media Publishing tool does allow you to compose your tweets and status updates, but I find if I am brainstorming multiple messages it is easier to work offline, compose them all, and then go in and copy/paste them into the scheduling tool. I use a spreadsheet to compose my messages, it has a function [=LEN()] that calculates the number of characters used so I know if I’ve exceeded the 140 character limit for Twitter. I’ve attached the spreadsheet here – FREE DOWNLOAD – in case you want to download it and use it yourself. I wound up with about 20 different messages to promote the blog series (see attached spreadsheet – FREE DOWNLOAD). Then I went into the HubSpot Social Media Marketing tool and started cutting and pasting them and choosing dates and times for their publication. I spread out the promotion for more than 1 week and it really gave me a chance to highlight multiple points, relevant to multiple personas within our target market. Your hyperlinks are automatically shortened to 20 characters and HubSpot creates a tracking link for them so you can track the number of clicks that result from each message. You can publish to any of your connected Social Media accounts. I usually set it up to publish the same message to our Twitter account, Facebook page, and to my personal LinkedIn profile. (Why my personal profile? See limitations below.) Then I click “save” and then go back in and edit the Facebook and LinkedIn post to lengthen and clarify the language slightly (i.e. get rid of the “caveman speak” that Twitter’s 140 character limitation sometimes forces you to use) and remove any Twitter hashtags (I think they look obnoxious when you include them in Social Media other than Twitter and just tip your hand that you are broadcasting a message in multiple channels). You can choose the thumbnail picture associated with the post from any picture file at the destination URL (would be nice if you could also upload a thumbnail). You can edit the preview text associated with the destination URL, which is very handy. Facebook EdgeRank penalizes 3rd party posting tools, so you will not get as many viewers seeing your posts if you use 3rd party posting tools. Here’s an article about it: “Facebook Content Published Via Third-Party Tools Suffers 67% Fewer Likes.” So whenever possible I will avoid using HubSpot to post to Facebook and instead do it manually. This is really lame that Facebook does this. They say they want to be friendly to small businesses, but this is just another way they willfully make it difficult for small businesses to do Facebook marketing. HubSpot has no ability to post to Google+. According to my HubSpot consultant there are no 3rd party tools that allow you to post to Google+ because they haven’t yet opened up the API. So I usually copy my LinkedIn posts and manually paste them into Google+. HubSpot has no ability to post a LinkedIn company page status update. 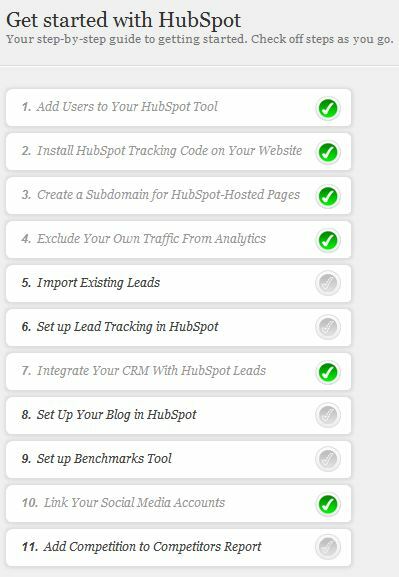 Again, according to my HubSpot consultant there are no 3rd party tools that allow you to do this, it is a limitation of their API. So I usually post to my personal LinkedIn profile and then manually cut and paste it to the company LinkedIn page. The HubSpot Social Media Publishing tool shows you which messages have been scheduled (yellow light), which have been published (green light), and which have encountered errors (red light). It also tracks the number of click-throughs associated with the URL. HubSpot tracks clicks only. No measurement of retweets or shares or likes. No measurement of new followers/likers. It looks to me like it is more focused on contact management and conversation monitoring, and less on the publishing side of things. Not sure if there are limitations (i.e., maybe you need the Professional version of either Hootsuite or HubSpot or both to capitalize on all the features of the integration). Maybe it has a better interface for composing and scheduling your messages? Maybe it has better tracking beyond just clicks? Anyone with experience please comment below. Added the HubSpot tracking code to our website footer, landing pages, and blog. Simple copy and paste. Since then daily reports of our website traffic have been emailed to me and my colleagues. Reports include company names, how many users from that company visited, what pages they viewed, the referring web page, and what campaign they are tied to if it was a campaign that drove them there. It is not really a lead report because there is no contact info for anyone who is not already a HubSpot lead. But it is pretty interesting and potentially valuable for sales prospecting to see what companies are visiting your website. Set up SalesForce.com integration. This was pretty easy, thanks to exceptionally good “how to” documentation in the HubSpot Help & Support Center. Even so I had my first call with Tech Support, which was strikingly pleasant. First call with my consultant, Leslie. Like everyone I have dealt with at HubSpot so far, Leslie is smart, super friendly, high energy, likes to laugh… they clearly recruit for this personality and it is a great reflection of their brand. Everyone you talk with at HubSpot is committed to making marketing and getting stuff done fun. Leslie reviewed the agenda for our once per week consultation calls for the next 6 weeks. With the help of IT I set up a subdomain (web.tubifi.com). The subdomain is where you post all your HubSpot pages (landing pages and blog articles). These pages sit on a HubSpot server. By virtue of sitting on the HubSpot server, you take advantage of all the HubSpot features: tracking, lead handling, social media & email integration, etc. But thanks to the subdomain you would need to look very hard at the URL to know that. And HubSpot automatically duplicates your website’s header and type template, so the pages fit in seamlessly with the rest of your website. 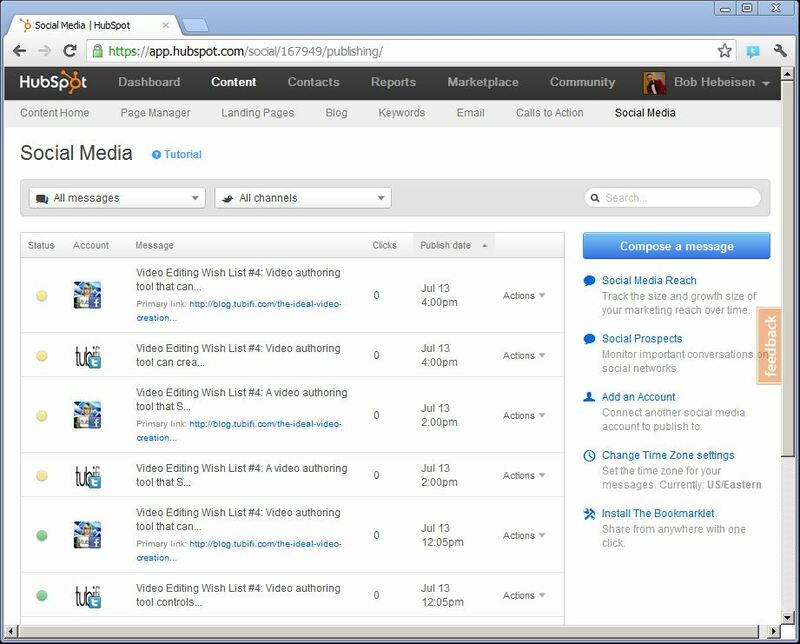 You can publish updates to your social media accounts directly from the HubSpot console. Still trying to figure out if you can publish directly to your LinkedIn *company* page status update, and if you can publish an update to Google+. HubSpot uses your social media account info to create a “connect with Tubifi” module. The “connect with Tubifi” module appears on all landing pages and emails. Still trying to figure out if HubSpot can use this info to create a “share this” module. Designed my first HubSpot email. I was frustrated at the limitations on the layout for HubSpot emails… I may become a beta tester for their new email program to be launched broadly in June. Set up my first landing page: “Free On-Demand Webinar: How to Create Affordable Video Marketing and Drive Revenue.” Essentially I created a gateway that makes people fill out a lead capture form before they can access a recorded webinar that I had already posted. The landing page was really easy to create and customize with HubSpot. I even built a custom confirmation email that is sent to anyone who completes the form. Promoted my first landing page and saw form submissions start to roll in. Social Media: posted the campaign to Facebook, Twitter, and LinkedIn. Email Marketing: swapped this offer into a 3rd party email program we have been participating in. I’m pleased to report that Tubifi just subscribed to Hubspot! I have been following Hubspot’s blog and twitter feeds for quite some time. They really do an impressive job of not just talking the talk, but walking the walk. Just tons of great, practical tips about “inbound marketing,” SEO, email marketing, content marketing, and lead nurturing. And they are putting these best practices to work in their own marketing. I’ve seen several sales presentations and demos, and it all looks pretty intuitive and easy to use. I gotta say, our sales rep was really good. The first presentation I saw was conducted by a technical rep, it was a deep dive on some advanced drip marketing functionality. But other than that, the sales rep just conducted the demos herself by sharing her desktop and showing how she and her colleagues at Hubspot use the tools themselves. I think the ability of a non-tech to give a compelling live demo is really powerful for a tool like this. One of my colleagues suggested we could perhaps get free or low cost solutions to accomplish the same goals. That may be true, but stitching together a bunch of free/cheap tools to do the job sounds too much like a science project and a recipe for inefficiency. For example, it took me about 4 hours the other day to try to run a batch conversion of leads to opportunities in Salesforce.com using a free spreadsheet utility… Ultimately I failed and, guess what, the same colleague who suggested using free software had to bail me out and do it himself. Our biggest challenge is capacity. 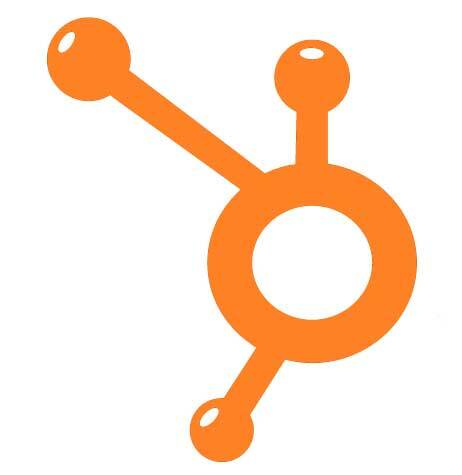 Hubspot costs roughly $1K per month, a reasonable investment if it can increase my productivity significantly and function as reliable plumbing to connect our sales and marketing activities.